VeriCite offers both a native integration and an LTI integration for Sakai. The native integration works within the LMS's Assignments tool and is enabled as part of your Sakai installation. The LTI integration may be configured separately without modifying the Sakai code base or properties. You may install either or both integrations in a single instance of your LMS. Most institutions make the LTI tool available to system administrators so that they can access the admin features and reports via the LTI interface. If you have not already installed VeriCite LTI as part of the native integration installation, you may add it as a system tool to your Sakai instance via the Administrative Workspace GUI. In the Administration Workspace, select External Tools. Click Tools Available in System. Zoom: Click Tools Available in System. Enter the LTI configuration information for VeriCite. Zoom: Enter the LTI configuration information for VeriCite. In order to make the tool available in all sites, leave the Site ID field blank. Enter VeriCite as the tool title. Enter VeriCite as the button text. This is the text that will appear in the course tool menu. Provide a brief description of the VeriCite tool, for example "Plagiarism detection service." 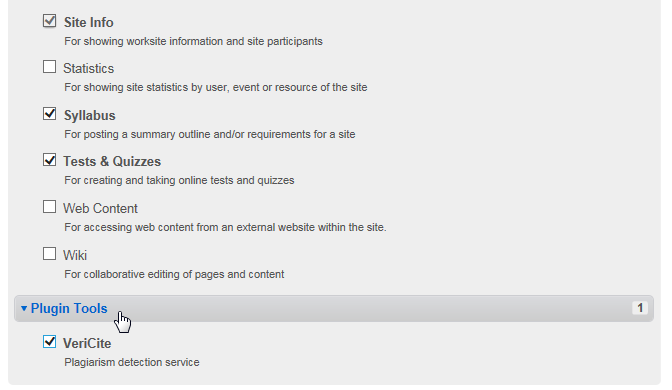 This description will display to instructors when they select the tool from a list of available tools in their sites. Select Enabled for the tool status. Enter the launch key provided by VeriCite. This key is unique to your account. Enter the launch secret provided by VeriCite. This secret is unique to your account. Check the boxes for Send User Names to External Tool and Send User Emails to External Tool. Check the box for Provide Roster to External Tool. 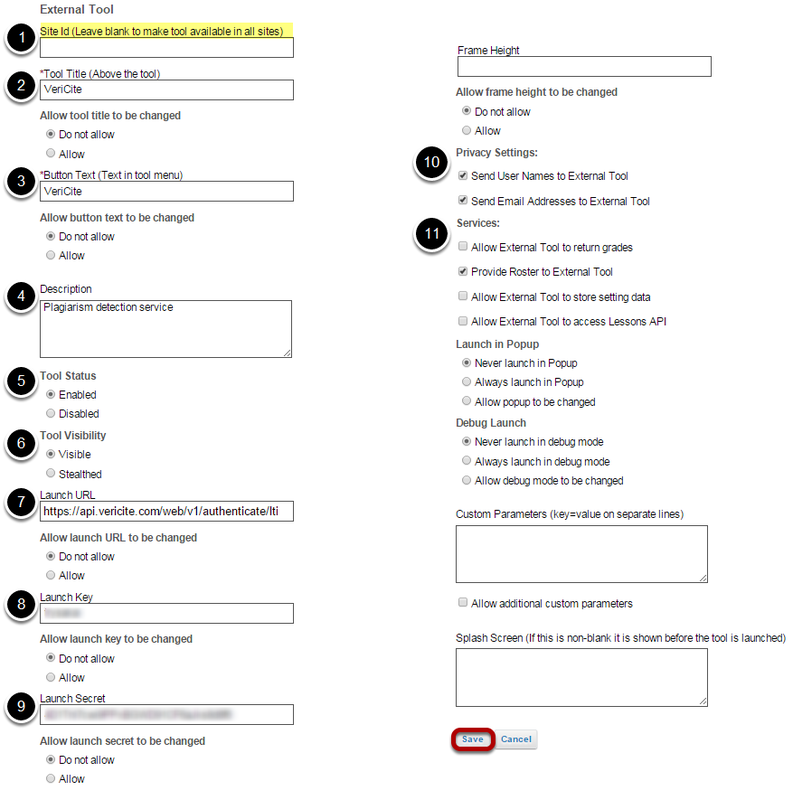 Click Save to save the tool configuration. You will now see the VeriCite LTI tool listed as one of the tools available in the system. Zoom: You will now see the VeriCite LTI tool listed as one of the tools available in the system. Now that the VeriCite LTI tool has been added to the system, instructors will see it listed as a "Plugin Tool" when they go to Site Info > Edit Tools. Plugin Tools are displayed at the bottom of the tool listing, beneath the general Sakai tools that are available for selection.